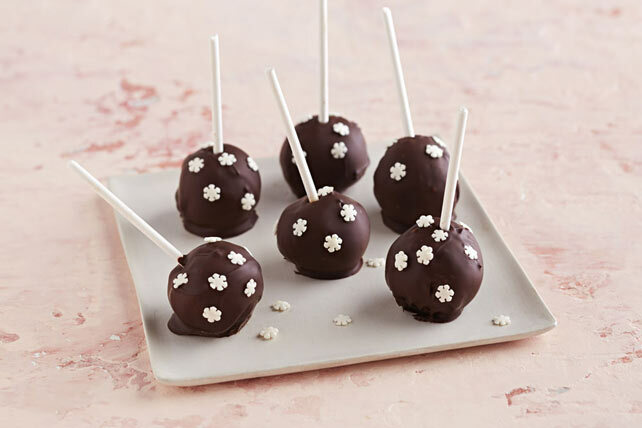 When it comes to easy, no-bake desserts, these "cake" pops win hands down. With only 2 ingredients, you'll be tempted to make a double batch! Insert 1 lollipop stick into centre of each donut hole. Melt chocolate as directed on package. Dip pops in chocolate; place on parchment-covered rimmed baking sheet. Store in tightly covered container in refrigerator for up to 3 days. After dipping the pops in the melted chocolate, garnish with your favourite sprinkles, chopped nuts or toasted flaked coconut.